Not sixty seconds into Beautiful Friction and it is clear; the haunting guitar of Jamie West-Oram, expressive synth of Rupert Greenall, pounding bass of Dan K. Brown, steady beat of Adam Woods and unforgettable vocals of Cy Curnin add up to the undeniable sound that could only be The Fixx. Apart, you couldn't refute their talent, yet it's together that they shine. 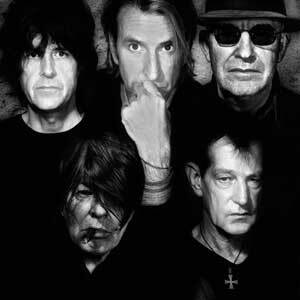 Together, The Fixx has an incredibly strong voice, strong legacy and strong future. Beautiful Friction, the band's tenth album studio album, finds The Fixx sharper than ever. Never at a loss for what to say, Cy Curnin and company have the same thought-provoking intensity fueling their lyrics and performances as they ever have. Fired up and as hopeful as ever, the band continues to take us on a journey which started in 1982 with the release of Shuttered Room. Says Curnin, "There's a theme that traces through The Fixx. Our catalogue is connected, our viewpoint as a collective has always been socially driven. With the Internet, things sped up, and we were able to get feedback quicker and became closer with our fan base. We've been so thankful to hear from people who let us know our music made a difference in their life. It made us realize we had a sense of responsibility to our audience, that our work as a band was unfinished." After seminal hits such as "One Things Leads to Another," "Red Skies," "Saved By Zero" and "Stand or Fall," The Fixx has always been very conscious of making sure it had something to say. "At first, there wasn't a motif floating around. Then new songs started to emerge and we had a theme. The first song for Beautiful Friction that we wrote together was "What God?," followed by "Follow that Cab," and we agreed we had the meat." Says Curnin, "As a whole, we were very focused on what was happening in the world around us and the legacy that was being left for our children, for everyone's children. This album confronts our frustrations with the current socio-economic crises affecting the world, but it's also quite hopeful." With Beautiful Friction, the band has created a backdrop of responsibility and the need to be accountable for actions. "It seems we've all ground to a bit of a halt with so much unrest, the Occupy movement, debt, war and more. We ultimately see the album as positive, eager for the dawn of a new era, the possibility to change the way we see the world and to view it with more optimism. That's why we called it Beautiful Friction – the times we live in are tough, but there's a beauty in that. There's a hope." The early to mid 80's was marked by several Top Ten Billboard hits for The Fixx. Curnin recalls the band's "MTV Days" with great fondness – how he felt he could have been singing "Ham and Eggs" instead of "One Thing Leads to Another" because the groove was so strong, how girls would throw underwear onstage while they played "Red Skies," a song about the aftermath of a nuclear fall out and how "Saved by Zero," a song about accepting emptiness, still resonates today. Curnin calls the way the band's music has been internationally embraced the greatest gift. Referring to this as "the Mary Poppins Effect" where a 'spoonful of sugar helps the medicine go down,' Curnin feels the music's accessibility allows for his lyrical expression on some heady topics. "The melodies that Jamie comes up with are incredible. He is always creating bits and pieces, then I come in and get a feeling for a word, or an emotion, and it starts to take shape. We get something we can play as a group. Then, it just takes off like it has wings. Rupert is almost like a mad scientist, wherein I can describe where I am going visually with my words and he paints the sound. Dan has amazing chord knowledge and is able to play around my voice in ways that makes it sound rife with emotion. And Adam just isn't a convoluted drummer. He's very careful and laid back, which is big part of our sound." With Beautiful Friction, all eleven tracks connect across a theme. "Unlike my solo albums, which focus on my own peccadilloes, the songs written for The Fixx take on the problems of the world. If you look back at our work, there's a universal application to it. In writing Beautiful Friction, we speak to people who have woken up to the fact that while there was a period of easy money and easy credit, it's now come and bitten us on the backside. I think, as you get wiser, you begin to realize less is more, and how happiness itself is your real currency." The album was produced by Nick Jackson at Spacehouse Studios in London, who worked closely with the band to draw from the root of their longevity: communication. "Nick spoke out candidly when he thought a song wasn't quite there yet and allowed us all the time in the world for the creative process to work itself out," explains Curnin. "And on top of understanding how creativity needs to be nurtured so a song can develop completely, he is technically very adept in a way where he let us keep our style intact without having to sound like we were chasing the latest recording trends." The songs recorded for Beautiful Friction are a high point in the band's already heralded history. Echoing the frustration and pain of the "99%", the first single "Anyone Else" is an anthem for our times, with a soaring melody that allows the song to feel melancholy and hope all at once. Optimism grows further with the wistful "Just Before Dawn," the album's second track which speaks of hope after the darkness. "What God?," a philosophical tour de force, features a passionate vocal wail of confusion, doubt and self-revelation by Cy, backed by the band's driving musical crescendo. The frenzied wired pace of "Follow that Cab" delivers a lyrical metaphor, with the cab as an allegory for a life out of control. The optimistic "Shaman" could be the long lost musical sibling to "One Thing Leads to Another" while the title track highlights a unique vocal coupled with a sensual groove and evocative keyboard. "Girl with No Ceiling" captures the present, wise and introspective band meditating on the fleeting reality of fame and fortune over a subtle beat. The Fixx, never a band to rest on its laurels, is still searching, still asking questions and still seeking truth. Curnin calls this current evolution of The Fixx "a fine wine that has aged well in the bottle. I love being in this band. It's my therapy. You can take everything away from me, but no one can take away the relationship and creativity that flows between the five of us."